If you love to swim or snorkel in the ocean, if you want to stroll on a beach as the sun sets, if you want to spend evenings relaxing in the on-site hot tub while not spending a fortune, then our no-frills studio unit at the Maui Banyan in Kihei, across the street from the Kamaole II Beach Park, is your ideal headquarters. Our air-conditioned rental comes with all the beach paraphernalia you might want - beach umbrella, portable beach chairs, boogie board, beach towels and more. By booking with us, you avoid a $20/day amenity charge for using the acclaimed Maui Banyan resort, yet have complete access to all the facilities, such as the tennis court, outdoor grills, two swimming pools, jacuzzi spas and more. Onsite parking is free with your booking. You'll have two double beds, a mini-fridge, microwave, coffee maker, private bathroom with shower and a private lanai (patio), where you can eat a quiet breakfast or lunch with a near view of the ocean through the palms. Usual occupancy for the studio unit: 1 or 2 people. It is perfect for either a couple or two friends traveling together. It can also work for a family with one or two small children. NON-SMOKERS ONLY, PLEASE! There is no smoking allowed either inside or on the lanai. The unit is cool and quiet, with blackout curtains that allow you to sleep late, a lighted lanai where you can sit out or eat at night (without bugs). The lanai is always shady and cool. With a ground-floor location, you won't need to lug stuff up and down stairs or wait for an elevator. We have on-island management so you can enjoy a carefree Maui vacation. We offer secure online booking with credit card or echeck and respond to all inquiries within 12 hours. If you select the 'Book It' option, please tell us about yourselves and your vacation plans so we can make sure there's a good match. Because this unit doesn't include a full kitchen, laundry facilities or daily maid service, the longest booking we accept is for two weeks. Hawaii tax registration number: W11072302-01. We live on a lake in Massachusetts, where we swim every day we can, and were looking for a spot where we could swim other months of the year. Hawaii was the 50th state we visited and Maui turned out to be perfect for us. Our Maui Banyan location is across the street from the best swimming beach in Kihei - no rocks, expansive, manned by lifeguards 7 days a week. If you love to swim, bodysurf, snorkel or make sand castles, this is the beach for you. We love the fact that our unit is just a one-minute walk to the ocean, close enough to hear the waves when we are in bed, and yet far enough back from the road that traffic noise is not a major annoyance. Maui is an island with many microclimates, and our location gets much less rain and less wind than spots even a mile or two away. We were lucky to discover the Maui Banyan on our first trip to Hawaii, and while we looked at many other condo complexes, we didn't see any others with its convenient unit layout, quiet tropical setting and unsurpassed beach access. Some more high-end complexes require you to navigate a steep hill to get to and from the beach or offer distant ocean views but no walkable beach access at all. Also convenient are all the shops and restaurants within an easy walk that remain open till 8 p.m. or later. Within the Maui Banyan complex, our location on the ground floor of Building F is perfect for visitors without the energy or ability to climb a lot of stairs, who want to be far enough away from the road to enjoy a good night's sleep yet close enough to get to the beach in no time. Whereas some Maui Banyan units get miserably hot because of their placement relative to the sun, ours faces north, so that the lanais stay cool all day, every day. Be sure to bring binoculars! During the winter months, you can see whales with the naked eye at the beach across the street; the binoculars show you the whales' antics more clearly. 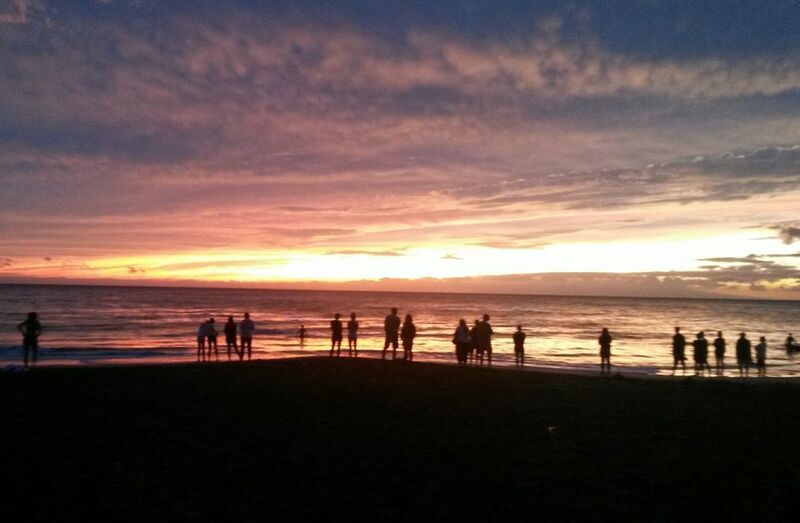 And you'll be entranced by the breathtaking sunsets at our beach. Almost every night, the sun turns the sky orange, yellow and pink in a dazzling display of nature's beauty. We regularly swim with giant gentle sea turtles here. And it's a joy to observe families bonding over the construction of architecturally complex sand castles. You are sure to bring home a treasure chest of memories from your Maui Banyan vacation. A peek of ocean view from the lanai (patio). Beach towels plus regular towels. Condo complex has a sizable swap shelf of beach reads. Shady yard hardly ever used by other condo guests. Shady private lanai convenient for meals or just relaxing, with an ocean view. Reserve your tennis court time and borrow racquets/balls on site at no cost. Suitable for one or two over-21-years-old adults, plus one or two small children. Two swimming pools. And two hot tubs. This is a ground floor unit with only two stairs from the unit entrance to the parking area or the street. Maid service during your stay is provided only on special arrangement in advance. My wife and I enjoyed our stay in this 1st floor lockout unit, hotel style room.. This is in a concrete building and we did not experience noise from the adjacent unit. The room includes a full bath with walk-in shower, mini-fridge, microwave, coffee maker, TV, internet, a small patio with a table and two chairs and loads of items for the beach. Bath and beach towels, hairdryer, two coffee mugs and parking for one car are also included. The unit was clean, beds were comfortable and we made breakfast & sandwiches in the unit. The unit is close to both the beach and one of the resort pools - we can see the ocean from the lanai. Since this is a 1st floor unit, there is no hauling bags up stairs. There is a shared grill in a lovely grassy courtyard at the entryway. We spent our early mornings on the lanai having breakfast and then headed to the beach once it got hot. Between the bus service ($2 between stops or $4 for a day pass), and all that we can get to by walking, we did not bother to have a car except for the last day. Great experience and location close to beach however bedcovers and rugs very stained. Little bugs kept landing on us inside room. Several traps for bugs etc. Exterminators came in and sprayed units while we were there. I’m ok but never slept under blankets. My sister did and caught extreme itch problem and major rash. Red bumps all over her arms legs and body. Also mini fridge freezer door was broken off so couldn’t make ice or use it. Would highly recommend little larger fridge, small stovetop hotplate along with set of 4 glasses,mugs,plates, bowls & cutlery and new pillows and bedding & towels (towels, pillows and bedding are very old) badly need extermination of bed bugs & rugs and shampoo rugs and need some hangers for closet. Otherwise good. I'm very sorry that one of you experienced a rash while staying in Maui. It may have been a reaction to sunscreen, or the sun, or the ocean, or the hot tub, or something else in our tropical environment. However, it wasn't due to bedbugs! Not only did we do a rigorous check of the bedding and mattresses after receiving your review, but also none of the four sets of guests who stayed in the unit after you reported any issue with bugs. We have professional pest control treatments quarterly, and we supplement that with additional measures if a guest alerts us of a problem (which you regrettably did not), or if our cleaners spot a problem. And thank you for all your upgrade suggestions. However, our unit is not described as suitable for preparing 3 meals a day in it, and we do not intend to equip it as a makeshift kitchen. Like many hotels on the mainland, we provide a small refrigerator, microwave and coffee maker as conveniences for our guests. Indeed, we wonder if all the food you brought in and kept around attracted the bugs you saw. When we inspected the unit, we did not see any bugs at all in it. For any future guests reading this review, please understand that if something is not right (such as bugs), it's best to tell us while you are there so we can spring into action and take measures to make it right. We want you to have the most trouble-free Maui vacation that's possible! Room was exactly as expected. Like a hotel or efficiency, neat and perfectly located on the island! This little place was perfect for my husband and I as we are no frills kinda people who want to be out exploring and not sitting in a hotel room. The mattresses were nice and firm, the room and walk in shower were dated but clean, it was nice to have a table and 2 chairs inside and out on the Lanai as well. The WiFi was spotty but serviceable. Microwave, coffee maker and mini fridge got lots of use since things are costly on Maui so we brought lots of non-perishables with us ;). The pools were nice and warm, landscaping pretty and the whole area was very neat and well taken care of. The complex is perfectly located on the island, if you don’t get a rental car you can walk to tons of restaurants, shops and 3 beaches. We got a car so we could do the whole island, which we managed on 2 tanks of gas (recommend pre-paying it’s cheaper). Plenty of parking in the complex. My sons and I had a wonderful time. All the eminities we needed were available along with prompt response from owner if we needed anything. If we go to Maui again we will be trying to stay at same place! As a new widow taking my first vacation alone in many years, I had a lot of special questions that were all answered in depth even before I finalized the booking. Marcia, the owner, left a stack of Hawaii-themed novels for me on the bedside table because I mentioned I liked to read. She also suggested some ways to easily get to know other travelers during my stay. And when the hair dryer went kaputt, I had a brand new one delivered in just 12 hours. Add to all that, a clean hotel-style room with good beds and a cute little patio, unbelievably close to the beach. Mahalo! I'm a light sleeper and was concerned that this unit would have a lot of road noise. Amazingly, considering the proximity to the beach road, it was very quiet at night. Dark, also, because of thick curtains. The unit was clean and well-equipped with beach stuff (much as shown in the listing photo, stuffed into 2 closets). The two of us had a wonderful beach vacation and cultural adventure and would not hesitate to book this reasonably priced rental again. No complaints at all! Our condo is right across the road from the best swimming beach in Maui, and only a few blocks from restaurants and shops. Even so, the property has a laid-back feel and there is next to no traffic noise at night. The condo complex has quiet hours and 24 hour security, so it's a safe, family-friendly location. $135/nt for studio unit, + $80 one-time cleaning fee + 13.42% Hawaii tax; Resort amenities, but NO RESORT FEES; free parking. Hawaii Tax ID #W11072302-01.